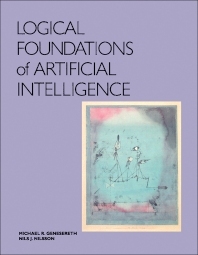 Intended both as a text for advanced undergraduates and graduate students, and as a key reference work for AI researchers and developers, Logical Foundations of Artificial Intelligence is a lucid, rigorous, and comprehensive account of the fundamentals of artificial intelligence from the standpoint of logic. The first section of the book introduces the logicist approach to AI--discussing the representation of declarative knowledge and featuring an introduction to the process of conceptualization, the syntax and semantics of predicate calculus, and the basics of other declarative representations such as frames and semantic nets. This section also provides a simple but powerful inference procedure, resolution, and shows how it can be used in a reasoning system. The next several chapters discuss nonmonotonic reasoning, induction, and reasoning under uncertainty, broadening the logical approach to deal with the inadequacies of strict logical deduction. The third section introduces modal operators that facilitate representing and reasoning about knowledge. This section also develops the process of writing predicate calculus sentences to the metalevel--to permit sentences about sentences and about reasoning processes. The final three chapters discuss the representation of knowledge about states and actions, planning, and intelligent system architecture. End-of-chapter bibliographic and historical comments provide background and point to other works of interest and research. Each chapter also contains numerous student exercises (with solutions provided in an appendix) to reinforce concepts and challenge the learner. A bibliography and index complete this comprehensive work.